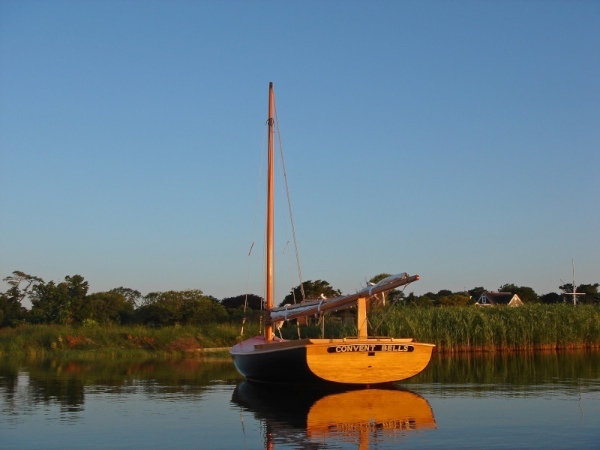 The Original Beetle Cat Boat was designed and built in 1921, and immediately began to appear along the shores of New England. Over 4000 of these boats have been built to date. 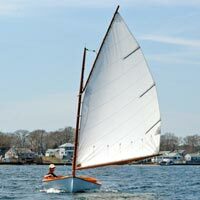 The design of the Original Beetle Cat was taken from the old 20-30 foot catboats that were used for fishing in shallow waters along Cape Cod. 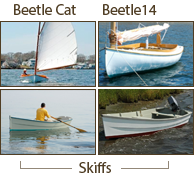 In the years since the first boat was built, the design has remained essentially unchanged. 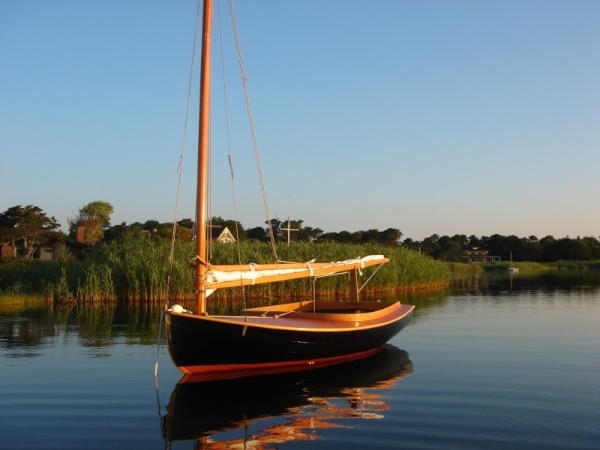 The Original Beetle Cat Boat is 12ft-4in long and is a design adaptation of the great Cape Cod Cats. 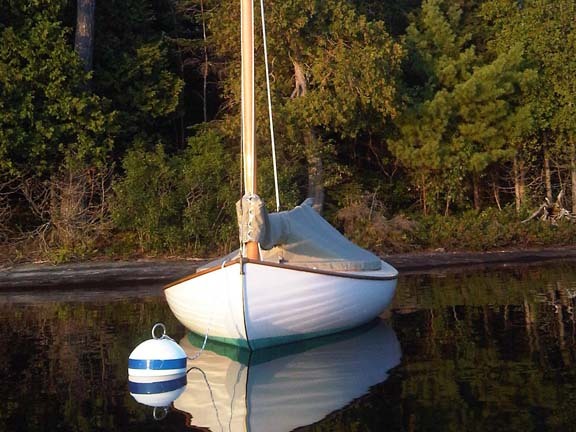 The wide beam, with the rudder not extending below the bottom of the keel, and centerboard that lifts up, are features that lend this boat to shallow waters. It is a boat that can be beached. The six foot wide beam makes it unusually stable and gives it a large carrying capacity. Made entirely of wood, featuring oak frames with cedar planking, with no ballast, it is unsinkable. The large decked area forward on the boat, means spray falls on the deck rather than inside the boat. 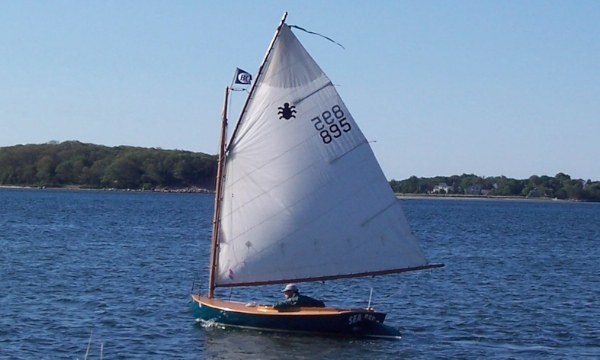 The rig is similar to that used on the old, large-size Cape Cod catboats, with the mast well forward, and using a single sail. 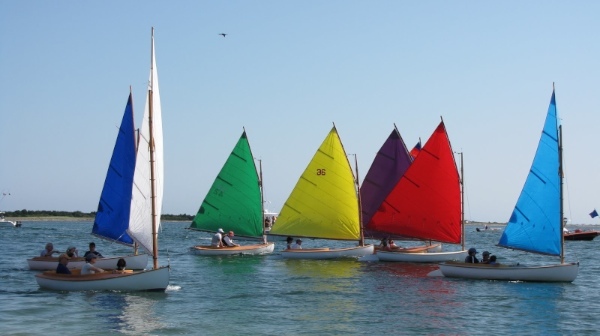 With this type of rig, known as a gaff rig, if you release the tiller, the boat will head into the wind and practically stop. This feature makes it an ideal boat for youngsters. Sail Area – approx. 100 sq. ft. Weight – approx. 450 lbs. 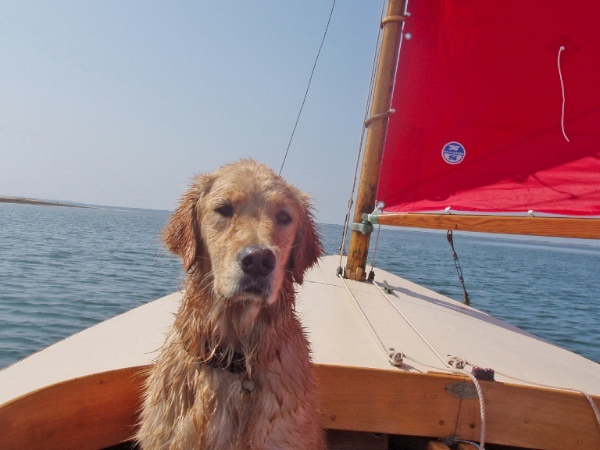 Includes: centerboard, rudder, tiller, boom crutch, mast, boom, gaff and all running and standing rigging. 1973 Starting with hull #1536 all fasteners, such as screws, bolts and nails, are now silicon bronze. They were previously galvanized iron. This change was made to prevent rust and the damage that it does to wood. 1985 Clew outhaul on boom becomes standard equipment. 1985 Coaming fasteners are wooden bunged. 1986 The two side coamings are book-matched, which means to be made from one plan of wood split down the middle on edge, and “opened” like a book, keeping the forward end of the plank together as the binder. This results in coamings which match in both grain characteristic and color. 1986 Spar racks – forward and aft for use when trailering – are introduced. 1987 Prototype plywood centerboard is put into use. 1987 Deck and rig hardware, previously sand-cast in brass, is now investment cast in silicon bronze for greater uniformity and durability. 1988 Extensions of bailer boards, which are the loose floorboards on either side of the centerboard box, are now made removable to allow access via a simple latch to the bilge beneath the cockpit. 1989 Centerboards are produced in plywood. Lead centerboard weight is moved away from edge of board for greater hold and ease of fairing. 1990 Combination Sail and Cockpit Cover is introduced. Unlike the standard cockpit tent, this cover has no ridge pole, requires no cut-out in the boom crutch, and allows mainsheet to run directly from boom to cockpit cleet. 1994 Port bow chock is introduced. This chock is the “mirror image” match for the standard starboard bow chock. 1994 Standard centerboard is now faired on the trailing and leading edges. 1994 Peak outhaul on gaff becomes standard equipment. 1996 Rubrail fasteners are wooden bunged. 1997 Standard rudder is now faired on trailing edge. 1998 Traveler now equipped with end stoppers. 1999 Cockpit paint is now optional. Natural unfinished cedar wood is now the standard cockpit. Beetle has an extensive list of parts and accessories available with our boats.